Builds the prism of base S and vector V. If C is true, S is copied. If Canonize is true then generated surfaces are attempted to be canonized in simple types. Builds a semi-infinite or an infinite prism of base S. If Inf is true the prism is infinite, if Inf is false the prism is semi-infinite (in the direction D). If C is true S is copied (for semi-infinite prisms). If Canonize is true then generated surfaces are attempted to be canonized in simple types. 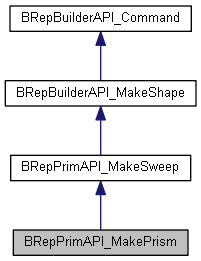 Builds the resulting shape (redefined from MakeShape). Returns the TopoDS Shape of the bottom of the prism. Returns the TopoDS Shape of the bottom of the prism. generated with theShape (subShape of the generating shape). Returns the TopoDS Shape of the top of the prism. In the case of a finite prism, FirstShape returns the basis of the prism, in other words, S if Copy is false; otherwise, the copy of S belonging to the prism. LastShape returns the copy of S translated by V at the time of construction. Returns the TopoDS Shape of the top of the prism. generated with theShape (subShape of the generating shape). Returns the internal sweeping algorithm.